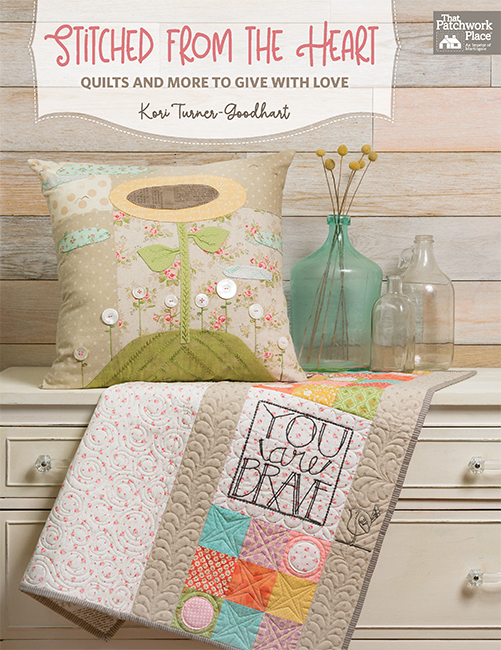 The latest book in our “Big Book” series may just be the biggest lap-quilt collection ever to land in your lap! In The Big Book of Lap Quilts you’ll find a whopping 51 patterns for the always-popular lap quilt—designs for everyday, seasons, holidays, and special days abound. And at just 55 cents per pattern, you’ll enjoy inspiration and savings! Pat Sloan • Cheryl Wall • Corey Yoder • and more! Lap quilts are the perfect size for so many reasons. They’re large enough to give you a sense of accomplishment and to show off your favorite fabrics, yet they’re small enough to finish in a reasonable amount of time. They’re just right for cozy cuddling, creative decorating, and more. They’re perfect to make and give, to create and keep, or just to have the perfect excuse to sew, sew, sew—for everyone you know! Drape them casually over couches and chairs . . . Display them on drawers, dressers, and armoires . . . Arrange them anywhere in your living spaces . . .
And of course, you can use them for the cuddliest purpose of all: as a quilt for your lap! Clockwise from top left: Cozy Home Lane by Kim Diehl, Petal Pushers by Jill Finley, Crosswalk by Jeanne Large and Shelley Wicks, and Peppermint Patties by Vicki BellinoSnuggled, folded, stacked, rolled, bundled, or hung—SO many ways to enjoy! What’s your favorite way to use a lap quilt? Tell us in the comments—we’ll choose a random winner one week from today and let you know by email if you win. And remember, when you purchase the book at ShopMartingale.com, you’ll be able to instantly download the eBook for free. Good luck, and thanks for stopping by for a visit today! We’ll email you about your prize, Sandy—congratulations! I love to use a throw quilt while watching TV. I love to make throws, so quick and a great gift. I love all quilts for all of the reasons above as well as for gifts. They are just the right size for me to quilt, too! I use a lap quilt for all of the above! Actually all of the above but I don’t watch TV too much..rather be sewing. My grandkids love to use my lap quilts while snuggling on the couch! Any time is a good time for a lap quilt! Lap quilts are my favourite size quilt to make. I have them in every room of the house. If anyone is every cold there is always a quilt close by to help you get warmed up. Thanks for sharing this gorgeous collection of quilts! I love to cuddle under a lap quilt while watching TV and hand stitching, especially on these cold winter evenings. All of the above! This is my go-to size of quilt to make for me and as gifts. Everyone can always use another lap quilt. I love a lap quilt for all of the above. I have them on every chair in my house!! They make wonderful gifts plus all of the reasons above! I love sitting under a quilt whether reading, watching tv, or just being. I think they make fabulous gifts. I use a lap quilt for all of the above – they are quite versatile! I use lap quilts for all of the above! I love to change them out with the seasons for a fresh look at home. Love, love these quilts. I want one of each! Sign me up!! What a wonderful wealth of great names these lap quilts come from and anyone would love this book for sure. All of the above -but most often to warm my side of the king size bed!!! It helps keep the peace between two people with different sleeping temperatures. I use lap quilts for all of the above! We always use our lap quilts while watching TV in the winter, or while reading books with the grand babies. I would love to win a copy of this book – thanks for the giveaway! I use a lap quilt for all of the above. All of the above. In winter to also keep warm. Wonderful for all the reasons listed above and so quick to make! I guess all of the above. I use a lap quilt whenever I’m cold and so does my husband. The grandchildren love to cuddle under them too. They are easy and fun to make. Lap quilts are my favorite to make and love using them for all of the above! When everything is done for the day, I love to cozy up to a quilt to read or watch TV or do handwork. It is like a fabric hug at the end of the day. So comforting. I use lap quilts for just about everything. They are the perfect size for gifts and even in different fabrics for a unique baby quilt! I use them for all the reasons listed. I love to wrap up in a quilt. We use our lap quilts to protect the sofa. I make this size most often as any larger and they are too hard to quilt on my Bernina. All of the above. I just love the casual look of lap quilts. Definitely all of the above! There are multiple quilts in every room of my house! I use lap quilts for all of the above. I love lap quilts! I have them all over my house. They not only look pretty and freshen up my home decor, but are useful for everything you suggest and more. All of the above. I love having lap quilts all around my house so anyone can cuddle under one anytime. Lap quilts are the right size for me. I enjoy them for all of the above reasons. This is a book I will need, as it is what I have been looking for! Thanks for sharing! Ooooo….Love lap quilts! My favorite way to use lap quilts is for decorating. I change my decor with seasons and holidays and work the lap quilts into my theme. It gives me reason to make varying styles and try new color combinations. Mostly for gifts, and for all the other reasons as well. Thanks for the chance. My favorite way to use a lap quilt would be a combo of looks and warmth, so I’ll have to go with all of the above, too. I love using them while taking a nap. It’s cosy and comforting! All of the above especially when the late afternooon chill sets in. My favourite way to use a lap quilt is all of the above plus putting them in a basket outside on a cool summer night. I love, love, love lap quilts! For snoozing, for watching tv or reading a favorite book, for gifting and donating. They are the perfect size! I’m always looking for new patterns. This new book is a great idea! All of the above! This is my favorite size to make. I use lap quilts for all of the above and my favorite way is to use them for decorating. I love lap quilts for all the above reason. I can change the whole focus of a room by changing out the quilts. I too, use them for above all. I love having my lap quilt, my dog and a cup of hot tea this time of year. All of the above are perfect reasons to love lap quilts, and I do! Quilts of any size are great,I love making,using, and giving them away. Lap quilts especially make a nice gift for some/anyone that may need a pick me up or just to know someone cares. Thanks for another great giveaway. I would have to choose all the above! Decor, adds colour to the rest of the room, and it’s amazing how each one just goes, cause all colours blend in with each other. And always when sitting in my chair and reading, watching tv, cuddling with the grandkids, etc! All of the above! Perfect size for gifting! Love the looks of the ones in this book! To freshen up my decor but more importantly to stay warm in the winter!! I live in Canada and our winters get very chilly to say the least! Thanks for the chance to win this great book! All the reasons above and as gifts:). My family uses them for all the above! I love to use a lap quilt to snuggle up in when I am reading or watching tv. I also like to give lap quilts as gifts. I love to snuggle up with a lap quilt when I’m not feeling to well. Nice to have a bit of home make love all round you at times like this. All of the above!! Plus they are wonderful gifts for Nursing Home, Hospice and Cancer patients. Living in Arizona, it’s rare to need a quilt for warmth, but I use throw quilts on the back of the couch as a decorator feature, as well as hanging on the wall as art. A throw sized quilt is perfect for this! All of the above, for sure. Lap quilts are also good for snuggling with our grandchildren! All the above plus they make great gifts and charity quilts. This looks like a great bunch of patterns. Thanks for the chance to win! All of the above! I have lap quilts all over my home so that one is always within reach. All of the above. However, this is my favorite size to make for gift giving. Napping definitely napping :0) What a fantastic book! Thanks for the chance. Snuggled up under a lap quilt reading my Bible in the morning, especially on these cold mornings! And then snuggled next to my honey after a long day at work watching the tv or talking. Covering a sleeping grandchild! I like them in my living room, draped over chairs, anyone can have one to snuggle up with. Lap quilts are my favorites for gift-giving. They’re quick to make and people love them for “all of the above”. I use my seasonal lap quilts to brighten up my home each month. But most of the lap quilts that I make now go to charity. I definitely would have to say all of the above! Quilting is my life. And I try everyday to quilt a little,even if its only 15 minutes.That being said, the quilts in this book are amazing!!! I would never need any other inspiration to make a new quilt!! Lap quilts are my favorite size to make. I use them for everything – the size is so versatile! I love to use my lap quilts to decorate and snuggle under! Sunday afternoons in the family room, to "read" the paper – and I always seem to have a nice nap covered with a lovely quilt! I like to use them around the house to bring in some different or seasonal colors. to keep someone else warm! I give away most of my quilts. We live in the woods in Michigan and a lap quilt makes a cozy companion while reading or watching the wildlife. Lap quilts are great for snuggling in while reading my favorite book or watching tv. Love to change the decor for the seasons by simply placing one on the couch. My lap quilts are perfect for snowy days like today. Wrapped up, on the sofa with a steaming cup of hot chocolate and a stack of quilt books and magazines to warm my heart. Best day ever! I like to use my one lap quilt that I own as a cute little table cloth on my kitchen table. It really warms up the space and makes it look comfortable. My grandchildren love to sleep under them. I always change them out over the months as sofa decoration. I like a small quilt for gifting. I usually give my quilts away so they are probably used for all of the reasons given. The book looks very interesting and I especially like the "Raise the roof" design. There are so many quilts in the book that I would like to make. I use small quilts to cover up with when I read. What a great book. I think lap quilts look beautiful and cozty anywhere in the home and so useful too! I use lap quilts in all those ways. So nice to be able to grab one when needed. My favorite way to use a lap quilt is for snuggling with my dogs while watching TV. I lLove the new book and see many patterns I’d like to try. While watching TV with my corgi dog in my lap. I use a lap quilt while watching TV here in chilly Massachusetts! I also like making this size quilt because I can quilt it myself on my domestic sewing machine. All of the above! Plus gifts for family! Lap quilts are my favorite for all of the reasons listed! I love sprinkling quilts around the house – in just about every seating space available and even on walls. Really adds warmth to the room. I mainly use lap quilts for just decorating. I usually throw over back of couch or chair. I use lap quilts for all the reasons suggested. Every sofa in our home has one. I have made lap quilts for the granddaughters as well. Would love to win this newest BIG book. Thanks. Well my first inclination was to say I use lap quilts for reading and watching TV, which I do, but then I had to admit that I really make them to add to my decor. Wrapping up in them is just a lovely added bonus. There is nothing better than curling up in a cozy chair with a good book and a beautiful quilt. I love all quilts and enjoy making them as I have 8 grandkids and 8 more great grandkids and they all love quilts. I like them when I’m watching tv and doing handwork. i have lap quilts every where; folded and stacked in chairs and on shelves, draped over chairs and couches, hanging on the wall, and best of all cuddled on the couch with me and maxx. All of the above. Lap quilts are my favorite size to make….I actually get them finished! My favorite way to use a lap quilt is to freshen the décor. It’s like changing the pillow covers with the seasons. The best part is, you can warm your toes whenever the mood strikes you. I mainly use lap quilts when reading or watching TV. My family loves having lots of lap quilts to use! I like lap quilts to keep me cozy while watching TV. I apparently make quilts for my 17 year old cat. It’s not a quilt until she’s slept on it. All of the above! Perfect size to finish and quilt yourself. I need lap quilts to keep my legs warm during sewing when my cats push the doors open but don’t listen when I tell them to close them! For snuggling up and watching TV! Thanks for the chance to win! watching tv and reading and for cat lap time. All of the above! I also love that the size is manageable to quilt myself on my domestic machine. I use my lap quilts around the house to provide a pop of color, but also to be at the ready for some snuggling! I love to hang lap quilts on a curtain rod that I mounted on one wall of my livingroom. I vote for all of the above. I love lap quilts! I like to change my quilts out to match the season, but they always are available to wrap up in for TV watching! Would love to make lap quilts from your book!! I wrap up in a lap quilt when reading or watching tv. I love to put lap quilts on empty walls to brighten up a room. I switch them around to different locations when I’ve completed another one. Eventually they get passed on to friends and relatives. I use lap quilts for all of the above reasons. My favorite use is for watching TV and napping. They are just right to snuggle under and take a nap. I have several for each season of the year. All of the above for sure. I have a quilt on me whenever I get to sit down! I love to decorate with them by draping them over the back of my couch or lay them over the back of my antique chair or even stacking them on the chair. 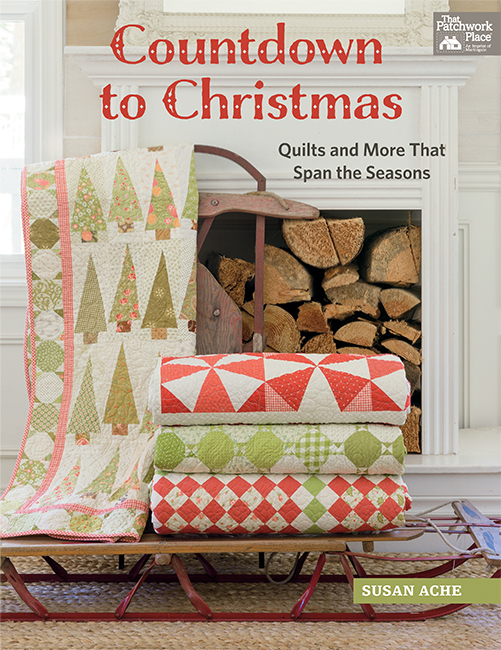 The quilts in this book are really pretty and I would love to make a couple of them. Hanging over the back of a chair ready to be used, when if geta bit chilly. Cats join in! Anytime I’m on the couch, I have one, even in summer, so I guess I would say all of the above! I would gladly replace all the odd afghans around the house for these beauties. I love them for all the above. Thank you. My home looks so cozy with quilts displayed on couches, chairs and hung on the walls. They are pretty and are within reach to cuddle with. All of the above! I am finishing up my Christmas lap quilt. I told myself that I’m not late–I’m early for next Christmas! I make them for all of the above reasons. I have far too many quilts in my home already, so to use up at least some of my unreasonably large stash, I make lap quilts for the Cancer Agency for patients undergoing Chemo, and for a local home for abused women and their children. So many patterns and fabrics, so little time! Also, I can quilt the lap size on my domestic machine, which reduces the cost somewhat, saving the long-arm magic for the occasional bigger quilt. Lap quilts are so versatile they can be used any where, any time. I like them as they go together quicker than a larger quilt. I love to make lap quilts. They are a go to size for gifts that everyone loves. I love to sit and read or watch TV covered up in a lap quilt and also sleep under one on my side of the bed when the hubby has the room a little chilly at night. That would have to be all of the above. Oh, and for gifting too! I use lap quilts for all of the above. I like to have some for different seasons and holidays. All of the above and when traveling in the winter. Makes a great gift! I love to make lap quilts because they are quick to make, I do drape them over the backs of the couches and chairs in the living room and family rooms of my house. When the grand kids come over and want to nap there is always a quilt to snuggle into, they have their favorites already. I even use one in my chair and if I have a busy day, and place one over me out I go for an hour or two. All of the above, of course! I especially like to rotate my quilts to spruce up the decor and keep things looking fresh. That also lets me make sure all of my quilts get a chance to be enjoyed! My favorite way to use a lap quilt used to be while reading…until I started quilting. Now I use them just to watch TV…when I take a break from quilting! As a new quilter, I don’t have many for any purpose! But this book would be a good place to start for great ideas and quick projects. All of the above, I keep a stack of lap quilts that I rotate seasonally. I always have something to snuggle with. Lap quilts are my favorite quilts. I live in Maine and lap quilts are so cozy during those cold winter months. It’s all of the above for me! I use them to decorate for the seasons, to snuggle under when it’s cold, and I love to use them for gifts. All of the above plus! I really need to take one along to the Nature Center retreats. It’s a lovely facility but on the chilly side in the winter! I would say napping, reading and watching TV are all great times for quilts! I love them for reading and watching tv and as a special gift. ALL of the above! I’d love to make each one in this book! Definitely all the above! Plus more! 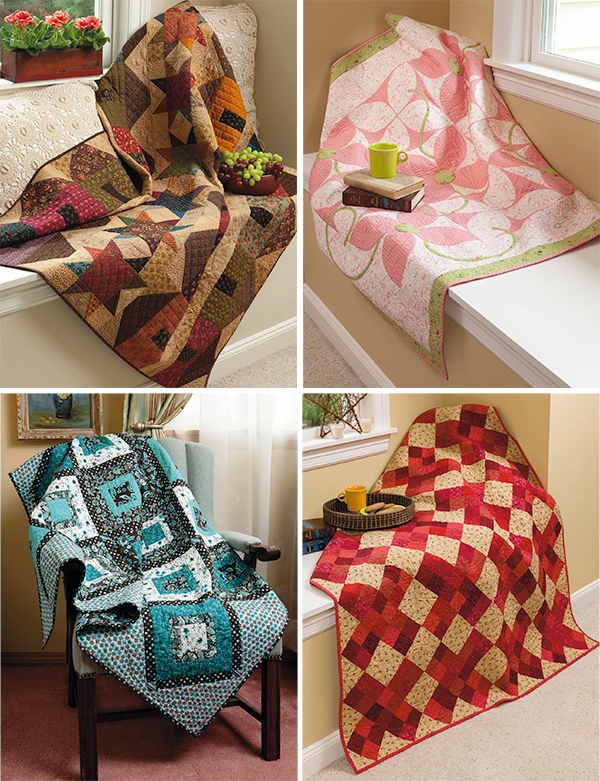 Just cozy up the house with a lap quilt here and there!! Snuggle under to read a book or watch tv. What’s not to love about a lap quilt?? This book covers every occasion. My lap quilts are on walls, over doors, over chairs, beds, couches and often grandsons and us. Love them! I switch out my quilts all the time to freshen up my decor! I love making,using and gifting my lap quilts! I like to display them throughout my house. Thank you for considering my entry! Lap quilts are great for snuggling in while reading my favorite book or watching tv. Love to change the decor by simply placing one on the couch. Any time I need to stay warm! I am a busy grandma of 5, all within three years. So I LOVE to look at them, and when I have an occasional afternoon to myself, the place where the quilt usually is on the back of the couch, shows up again, and the throw blankets grandma! I love them when I’m curled up on the couch watching TV. I love to make them for friends and the VA hospital. All of the above. Lap size is my favusize quilt to make! My friends call them “Jan-size” quilts. Lol! I love wrapping up in a quilt while reading or while taking a nap in my favorite easy chair. All of the above. Nothing better than snuggling under a cozy quilt or just looking and enjoying the eye candy. I use lap top quilts for decorating and snuggling under I also like to give them as gifts. You can wrap up in them or hang them to add some color to a wall that just looks plain and needs something. My favourite way to use a lap quilt is snuggling up with my cat and watching tv. My lap quilts are frequently used at our church for added colour. They are just the right size! Best way to end the day is relaxing on the couch, good book in hand and snuggling under a quilt. I love my quilts, but so do my family. I normally don’t get to use them, since they are being used by someone else! But if/when I get a chance, it’s curling up in them to read a book or binge watch Netflix! Lap quilts are my new jam. I’d love to have the group of patterns to choose my next project!! I use lap quilts for all of the above. I especially like to change my mood by using a lap quilt to brighten my bed. Perfect size! All of the suggestions! Lap quilts are my favorite give-away quilt. I love to use lap quilts for everything, especially to throw over my table as a big topper. To warm up under on a cold snowy day in front of the fire. These lap quilts are the sweetest! I love to cover up with one while I am hand-quilting it, and watching TV. Don’t like to waste potential quilting time! Lap Quilts make nice gifts for family and friends as gifts. Love all of these in this big Book! I love the variety in this book! I have quilts everywhere and use them for décor and for keeping warm. I’m currently planning seasonal lap quilts for the formal living room. I use them while watching tv, and sometimes for napping. I just think lap quilts look so beautiful and homey lying all around the house. All of the above, but always while watching TV in the evenings. Love your Big Book series. Anytime I am sitting. whether hand quilting, reading, knitting, watching tv or napping, a lap quilt is required 🙂 After seeing the quilts in this book, I am going to have a difficult time deciding which one to start making first. All of the above! I love the quilts that have been pictured! I do all of the above, especially while watching tv. I mostly use lap quilts for decorating my home or baby gifts, but really wished I used them more for reading and napping and cuddling with loved ones. Need to be making more! I love to make and give away quilts, they are all over my house!! I like to have them on the couch for watching tv, reading. I also like to have them on the beds in case we get cold at night. While reading and napping, of course, and also while watching TV. And sometimes even to hang on a wall! "All the above." And a nap with a beautiful quilt sounds wonderful about now. Definitely all of the above! Lap quilts are so versatile! Thanks, Martingale, for the lovely giveaway! I love to add splash of color in my rooms with lap quilts, but most of all I like snuggling with them in the evening when it cools off. All of the above. I cannot imagine a life without lap quilts. I love using lap quilts all of those ways. This book looks awesome and what a wonderful giveaway! I really hope I win this one, thanks for the opportunity! All of the above plus they make great gifts without it being a multiple year project! Will have to go for All of the Above. They are the right size for so many things, even a tea party with my granddaughter. All of the above! They are such a "useful" size. Every morning with my coffee, laptop and Martingales’ "Stitch "this" newsletter. I use lap quilts EVERYWHERE! On the couch, in the chair watching TV; I even throw a few on the bed when I need those extra layers. And lap quilts are my all-time favorite size to make! This is the perfect book! All of the above! I use them all throughout the house. All of the above. They are so useful and easier to finish. I would love to win the book. I love to have my lap quilts laying on the back of a chair or couch and pull them down anytime they are needed for warmth or comfort. There is just nothing like cuddling with a handmade treasure! All of the above! They are definitely the most versatile size! I use lap quilts for all of the above reasons. I love to make them for my grandchildren and my 90+ year old in-laws. I also use them for donation quilts. They are absolutely the perfect size and so doable! Nothing is better than snuggling under a lap quilt while reading good book. All of the above! Thanks for the giveaway. All of the above!! I love having a quilt close by to snuggle under, whether reading, watching tv or taking a nap. I have a few seasonal quilts I rotate throughout the year. I would say all of the above. They’re decorative when not being used for napping. I actually use them in place of a second large quilt on our bed, since one of us might be warmer or cooler than the other. Definitely love a lap quilt while reading. Nothing better than curling up with a book and a warm quilt. And they make good gifts. I think I have a lap quilt in every room of the house…I use them when I’m on the computer, sewing, watching TV, reading…it is nice to have one within arm’s reach. Definitely all of the above. But I really like the lap quilt size to donate to our local Veterans group. It is a size they really enjoy. All of the above but I especially like to give them to someone who is in need of a "warm hug"
I would dearly love to have this collection of quilt patterns found here in a book form. So many lovely patterns to make one would have a difficult time deciding which to make first. I love to use a throw quilt while reading. Sometimes I make one just to try out different colors or styles as these are a practical size to sew and quilt. I use lap quilts to cover my husband while he naps in his chair. These quilts are wonderful, I love the fresh and unique use of colors. Thank you for the giveaway! All of the above and they make great gifts when someone needs a hug. I love lap quilts: seasonal displays, nap, reading and tv watching cover ups! Life is wonderful with a cozy lap quilt!!! All of the above. My husband likes a cool room, and I use a lap quilt all the time to cover up and keep warm. Looks like a fantastic collection. I have lap quilts all over my family and living room for all of the above. Over all of the chairs and the couch! I use them for watching tv and reading, which usually also means napping! Draping over furniture, watching TV, napping all sound good to me. I particularly enjoy seeing someone else wrap up in one of my quilts. Hi, it’s while watching tv! Thank You for a great giveaway! Lap quilts are so rewarding and versatile! I love to cuddle under them in the winter! Love ❤️ lap quilts! Warm me,hang on the wall,as a table cloth,gifts,so useful. Great book! You can never have too many quilts!! Or quilt books! Love the new quilts in this book! All of the above and many more uses. All of the above. Lap quilts are my favorite!! All of the above. I have lap quilts on backs of couches, chairs, on the wall, etc! All of the above, plus they make the best gifts I can think of for children and adults. The samples you showed make me eager to dig in. My favorite is to take a nap, although all of the above is very special also. On the couch and gifting. Definitely while watching TV…something about being snuggled up watching the idiot box is so soothing. Lap quilts are great for donations to the local rehab center/nursing home, as they fit perfectly over a lap sitting in a wheelchair without getting caught in moving parts. Lap quilts are the maximum size I can maneuver in my workspace, so I make that size most often…most of which are donated to our neighborhood nursing and hospice center. Lap quilts are awesome! This book looks fantastic, too! Why limit yourself to only 1 use of the quilt. I prefer to have a lap quilt near/on me at any time. Lap quilts are for nap time of course! Watching TV or just when you want to be cozy. The book looks awesome! Lap quilts are used for all purposes here, decoration, while reading, binding a quilt, covering a sleeping dog… the size makes them useful for everything. I love draping quilts over furniture or on the wall or a mini on a shelf or table. But if I am watching TV or napping, you would find me in a quilt. So I love quilts for these and many more reasons. I use lap quilt patterns for baby quilts. I have 9 grandchildren and another on the way and have made all of them from lap quilt patterns. I’ve also made table toppers out of lap quilts. All of the above. I a,so like to use them as wall hanging for a larger wall. My husband likes to keep the house at sub arctic temperatures. Most of my time at home is spent cuddled up under at least one layer. I love giving them away to people I care about, but also enjoy staying warm during our Minnesota winters, using one of my favorites. Who wouldn’t want a pop of color in their family room ? 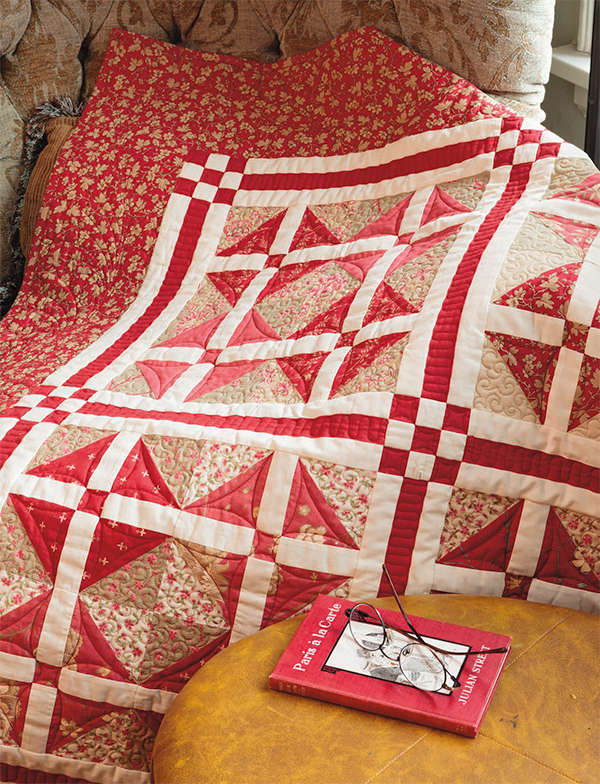 A lap quilt certainly adds a cozy, comforting feeling to a room. I like to display my lap quilts on an old ladder that sits in my family room. This gives me a chance to glance at them everyday. I also have a few that I roll up in a basket in the same room. Looks like this book as some really great quilts. I would love to add it to my book collection. I like to use lap quilts to change the décor of a room without major changes. My motto is keep it simple. Little changes make big differences. I love lap quilts to add that last splash of comfort and color to any room in the house. They make a room look cozy and are wonderful to cuddle under. This book looks great – got to have it!!! Lap quilts are a great size for a number of reasons. Besides those that were listed, also use for table covers. All of the above! They are so versatile! I use lap quilts while napping, reading, and watching TV. In my chair, watching TV in the evening with fabric or yarn in my hands! You can change the whole look of a room with a Lap Quilt. Add a pop of color to a drab corner, or change the whole focus in the room. All of the above. This book would help me pair down my stash (ha! ha!). I love lap quilts for all of the reasons listed. They are a great size to learn a new technique. I hang my lap quilts on the wall, drop them over a sofa, and display them on my bed on top on another larger quilt or a coverlet. All of the above. But if I had to pick only one it would be while watching TV at night and cuddling with my dog. I just lost my Maltese who was my best buddy and I’m on the look out for another. I use lap quilts for all the above plus they also make great gifts. I would have to say, all of the above. I love wrapping up in a quilt while watching TV and displaying them around the house. Especially changing them out for the seasons. Lap quilts are also a great size for gifting. I would use it for all the posted reasons but mostly to snuggle under while reading or watching tv. Lovely book and thanks for the contest. I love all of the above ways to use a lap quilt but especially curling up on the couch and watching a good movie! I love make quilts to give away as gifts and lap quilts are the perfect size for watching TV, riding in a car, snuggling with a grandchild or just curling up with a good book. The recipients are happy with the size and I feel good knowing that the donation was appreciated. I am always looking for new ideas and this book will give me plenty or ideas for future lap quilts. I use my lap quilts when reading and journaling. Lap quilts are also my favorite size to make for donation quilts. Totally all of the above!! All the above! It also works well when one person wants more warmth at night in bed and the other doesn’t. It’s just enough. My favorite way is curled up watching TV. I love to cuddle under a lapquilt and sew or to have a cuppa and read a good book. I use them "all of the above". It is my favorite size to make and use. Sometimes the bed quilt is just not quite enough warmth, so a lap quilt on top is the perfect solution. For sure All of the Above! thanks! I use lap quilts on the back of the couches and chairs so that people can just pull them over themselves when they get cold. I even use them in the summer, because sometimes the air conditioning is a little too cold for my taste. Lap quilts can be used for everyone, young, old and in- betweens. One is not enough and this book contains so many beautiful ones. My favorite is for a nap. Course, all the above is great use of it. I usually use lap quilts as decor but with winter here now, snuggling under one with a good book sounds really good. Reading, watching TV and over the back of the couch. Must consider adding napping to the list. The book looks really interesting. All of the above. I made one for my husband`s grandmother with wool batting to give warmth while was ill with cancer. She said it was so cosy. I use my quilts for all of the above. I also fold them and use them for table toppers in kitchen and outdoor patio. I use lap quilts for watching tv, having coffee, reading or just to feel cozy! All of the above. Looks like a wonderful book filled with beautiful quilts. Although decorating with lap quilts is fun, my favorite thing is to snuggle under one while watching tv! And when the need for a nap strikes, gotta have a quilt for that also!! Thanks for the chance to win! I love giving lap size quilts as gifts!! I also like them for reading, watching TV and changing them for the season and holidays!! They look good in guest rooms too!! Definitely all the above kind of person! I love to use quilts in my home decorating (on top of tables, hanging off the side of my antique pie safe, layered on ladders, inside stoneware crocks…all over!) plus I love, love, love to throw one over my lap when I’m chilly. Nothing says love like a homemade quilt! I use a lap quilt for all the things mentioned, plus I always have several cats snuggling there with me. To curl up with for a nap on the sofa! I like to use lap quilts to freshen my decor, but also to wrap myself in when I am watching TV. This book looks wonderful! Most enjoy using a lap quilt while reading to my grand-daughters! I make lap quilts for gifts, to hang as seasonal décor, and to donate to our Church Summer Festival auction. I simply MUST have this book for so many great patterns. All of the above!!!!!!!!!! I keep 5 or 6 lap size quilts on a small quilt rack in the den just so anyone that wants to wrap up will have one handy. I like being able to cuddle up in a quilt when I watch TV or read a book. Definitely "all of the above"!! I have quilts all over my home. I always have a quilt over me at night while crocheting and watching TV. This book looks fabulous! All of the above for sure!!! I am starting to make more lap size quilts, because as crazy as it sounds….I really don’t need any more big king sized quilts!!! You can use the lap quilts for decoration or warmth! Actually, none of the above. I make mostly donation quilts, but I also make lap quilts for my husband to use in his chair while reading and watching TV. He has several so I can change them out when one needs laundering of just to change what he has to look at. All of the above but mostly on the family room couches. So many quilt….so little time! I love to make lap quilts, largely because of their versatility. So I use them for watching TV, decorating, and reading, and for comfort when I am feeling under the weather. All of the above – lap quilts are my favorite size to make. Thanks. I love lap quilts when reading or watching tv. My cats live to snuggle up with me and sometimes we feel the need for a short nap. All of the above. I change my pillows, quilts and some dec items seasonally, so the more lap quilts, the better. All of the above and the ease of quilting them on my sewing machine. I love to change them for the seasons. They brighten up my home in the nicest way. All of the above, but my absolute favorite is while reading! Love to curl up on the couch under a beautiful quilt I made to watch TV. All of the above and I can quilt them on my sewing machine. I love to change them with the seasons. They are great to snuggle them for a nap, hang them, drape them over the banisteror the couch and they hang beautifully in several places in my home. How. I would love to win that great big book! All of the above! I love having my quilts in every room! They are such a comfort, as well as being decorative and useful. I always have one near when I am watching tv (or just in case I sit down and a nap suddenly seems like a good idea!! All of the above! Sometimes I also need a little extra warmth on my side of the bed so I will put a lap quilt over me. However, my favorite is curling up with a good book and a lap quilt…..why are they so snuggly? My favorite way to use a lap quilt is in the recliner, checking my quilting blogs. All of the above! I just like them to be used. Love this size quilt to hang on my wall. I love to snuggle under a lap quilt when I read or watch TV. My favorite way to use a lap quilt is while watching tv. Thank you! FINALLY!! I’ve been patiently waiting for this book. The postings on Instagram have whetted my appetite with all the beautiful quilts in the book. Lap quilts are my favorite size and I can quilt them on my domestic machine. I decided a few years ago to make quilts for my grandchildren as graduation gifts. Lap quilts are the perfect answer…I’m down 4, still have 7 to go 😉! And there are several in this book that have caught my eye. 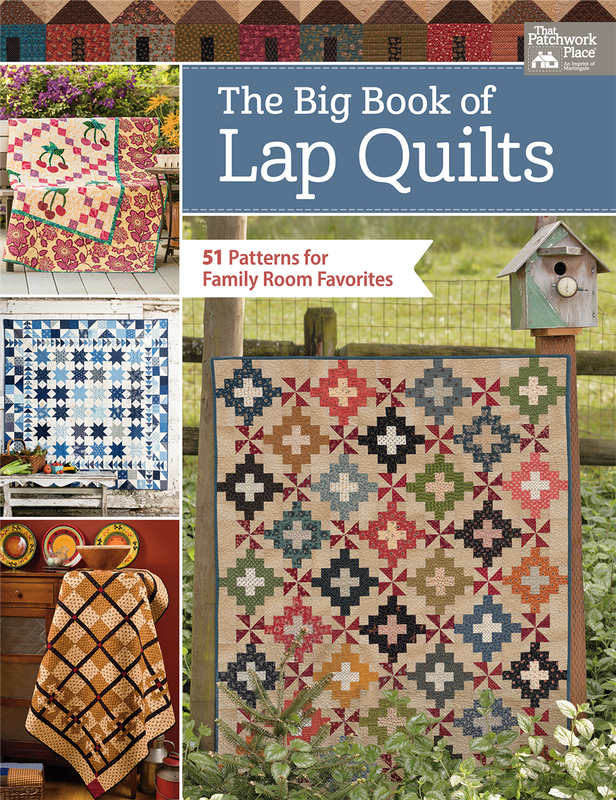 Looking forward to wandering through the pages of the “Big Lap Quilt Book”! What a onderful BIG book! I love lap quilts and need this! I like to use them all of the different ways suggested. Definitely All of the Above!! I certainly enjoy snuggling under a lap quilt but the real enjoyment for me is to find one slung over the sofa, love seat, or recliner! I use mine for beautiful wall art. Absolutely all of the above! They are the best size to make and to quilt. Thanks for the chance to win a great book! Making quilts make me happy. I love the selection process as I imagine where "this one" will go or is this one that I will keep. There is next the cutting which is sometimes fraught with concerns as I hope I have enough fabric to finish, the actual sewing, getting that first block done so you can see how it comes together. Completing the sewing and assemble is satisfying, the last is binding which I prefer to do in the evening while me and the big guy are watching our favorite tv programs, all around a very pleasant process. I have them on the chairs and sofa in my living room so they are ready when I need them. I make lap sized quilts for charity. I’m always looking for a new pattern in that size! In the winter I am always under my lap quilt. There are some beautiful designs in that book. How I would love to win it. I cuddle up any chance I can! I love this book! I want to make several of them from what I’ve seen of your pictures! All of the above! Laps quilts are my favorite size quilt. All of the options and also for display, folded on a shelf of an antique wooden bakers rack. My favorite way to use a lap quilt is all of the above, plus as a crib quilt or for taking a cat nap. They also make nice gifts for nursing homes or adjusted for wheel chair users. All of the options, plus display on a quilt ladder. I think a lap quilt looks great tossed over the back of the couch or a chair and I love to have one handy on a cold day. I love to use my quilts to cuddle under while watching television- but it’s hard to stay awake!! Lap quilts are the perfect size for décor! Throw over a bench, drape over the back of a sofa, or even folded up on a shelf! So many uses!!! All above 😊 Thanks for the chance. All of the above, of course. Lap quilts are great for so many things, not the least of which is comfort. On the sofa for watching movies or reading! I like to use lap quilts for long car rides and snuggling on the couch. All of the above! I love the look quilts add to a home. They are the WOW factor! Quilts add such warmth to a room and me! I love to snuggle under my favorite lap quilt while watching TV or reading a book ! Or better yet, while stitching the binding on it! A cozy quilt is good for all the above! The best way to use a lap quilt is to snuggle a kitty! While napping…with my cat, yes she has favorites! I love lap quilts for all the listed reasons above, plus they easily fit on my design wall. Curl up on the sofa with a coffee, a book and a cat. That is if the cats will let me have the quilt! Definitely while watching TV. Have been anxiously anticipating the arrival of this book! All of the above, plus use as gifts. I like to use a lap quilt to wrap up my pooch and myself while hand stitching, whether it’s embroidery, applique, or binding another quilt! Mostly I use a lap quilt for napping. In the colder months it’s also good for reading and watching TV. Love lap quilts for nap time in my favorite chair! I would check all of the above! There are several I would like to make! My favorite way to use a lap quilt is all of the above. They are especially nice to use on these cold, rainy days. Thank you for the chance. I love a lap quilt while reading, watching tv, snuggling with my dogs, or doing some sewing. I like lapquilts while watching tv. I am so excited to see this book! I own some of the other big books and love them. My favorite way to use a lap quilt is to cuddle with it on the couch on a rainy day while watching a good movie. . . .with my eyes closed, and snoring softly! I have to pick all of the above! Laps quilts are the easiest to decorate with and so easy to grab and use while watching tv with the grandkids, which all 3 want one to snuggle with and my 20 year old cat too! The Big Book of Lap Quilts has so many great quilts from wonderful designers!! Thanks for a chance to win this awesome book!!! ALL OF THE ABOVE! That was an easy choice!!! All of the above! My fave size to make as well as snuggle under in my recliner with my cat by my side. All of the above – lap quilts are my favorite size to make. I use them in all ways!! And for cats to sleep on!! I like to cozy up on the sofa in one of my handquilted quilts while watching my eyelids with the TV on in the background! All of the above! I love the quick and easy size for quickly changing up the decor in my little home! All of the above!!! My favorite size to make because they are so versatile. All of the above plus I make a lot of Lap Quilts as gifts for family members. If you make a bed quilt, it does not always match their bedroom décor, but a lap quilt can be used anywhere. I would definitely love to be the owner of that book. Any time, all the time…for snuggling in the winter, and spreading on the grass in the summer. I use our lap quilt to snuggle up when I’m working on the computer or doing my EPP hexigons. Robert, from northern Iowa where it’s cold. I love lap quilts for taking naps and watching TV. All of the above! Every chair, couch and ottoman in my house has a lap quilt on it. If I sit down I snuggle under a quilt before I do anything else because in the winter I can never get warm enough! Our RV gets pretty cold, so it’s nice to have a lap quilt in the evenings. Love my lap quilts. I use them for all the above reasons and always find new uses for them. I vote for all of the above. Keeping the breezes away on the deck, napping, and definitely remembering the people and places in every quilt’s story. I use lap quilts for everything! Love to sew that size. All of the above—-cuddling up in a quilt is nothing short of satisfaction. Absolutely, all of the above. Can’t have too many lap quilts. All of the above! Lap quilt or wall quilt is my favorite to make! Usually while taking a nap. Also, while watching TV. I love to make lap quilts because they are quick to make and I love snuggling up with them on the couch while watching TV. I also make QOV quilts so if I adjust some dimensions they qualify as the size QOV uses. Would love to have this book to help with that. All of the above! I like to keep them in the living room. For reading and watching TV. While reading and watching tv! I haven’t made a lap quilt yet – but this book looks like a great way to start! I use lap quilts both as a decor feature thru the seasons and to curl up with while watching TV. Definitely all of the above! Nothing snuggles better than a quilt. I like lap quilts in the car. Draped across backseat, ready for naps while traveling. Mostly I use lap quilts when sitting in my recliner reading…and sometimes nodding off…with my little dog by my side and a cup of tea. I like to use a lap quilt in "all of the above ways" listed! I like to give lap quilts as gifts! THanks for the chance to win the awesome looking book! What a lovely book of quilts or rather Lap Quilts. I would use them for all of the above. They would be fun to create and then decorate the living room, use for afternoon naps, watching TV or reading on a cool afternoon. This is a wonderful book of colors and ideas. Would be a delightful gift at any time. All of the above! And they’re fun to make! I’m brand new to quilting and would love the opportunity to try a smaller project. The patterns look very nice! All of those reasons! Love lap quilts! This book has great ideas! I love lap quilts and use them for all of the above. I like to take a nap with a lap quilt. I love lap quilts! I love snuggling and relaxing under one while watching Hallmark channel, and during the winter I often use an extra lap quilt or two on top of my bed to add extra warmth. Great book! I use my lap quilts in all of those ways! They’re my favorite quilts to make! All of the above. But especially for decorating. Can change the feel of a room for seasons, etc. They are a must! I love to use lap quilts whenever I can, reading, resting and watching TV. They are beautiful any where ! All of the above – lap quilts are so versatile and can be quilted on my home sewing machine. Well, I usually start out reading, but it seems to change to napping after a while. My favorite use is curling up with a good book and soft quilt. All of the above but especially napping. I enjoy using a lap quilt anytime I am sitting still and reading or watching TV, they also give my home a cozy look. All of the above! Lap quilts are wonderful! Your new book looks fabulous and I can’t wait to get one! I mostly use lap quilts for decor, but use some for covers. This looks like a great book full of wonderful quilts. I like to use lap quilts for all of the above. Plus they are a nice size for gifts. All of the above, but not all at once! 🙂 Usually, i have a quilt on my lap and an English paper piecing project in my hands! Used to keep my feet warm while watching TV, reading, hand sewing, doing the crossword puzzle, and more!! I love lap quilts and use them whenever I can. I also like that they are a size that I can quilt easily on my domestic machine. Thanks for a great publication and for sharing by offering a giveaway. All of the above !! Lap quilts are my favorite decorating accent and always in use at our house for reading, movies or sick days. Nothing warms or comforts like a lap quilt. Napping!! So perfect for taking a quick nap on the couch!! Thanks for giving us a chance to win that yummy looking book! What a great book! Lap quilts are the best size. I love to curl up on the couch reading or watching tv under one. We always have multiple quilts on the couch. Everyone has their favorite. I loved all of the quilts and the uses you chose but my favorite use is snuggled with a grandchild under a quilt while we read a book or watch a favorite movie! Perfect size quilts are the lap quilts! Would love to have this book to give the patterns a try with some of my fabric stash. Honestly my favorite way is to donate the lap quilt. It is a perfect size. Easy to handle for piecing and quilting. I try to make at least 2 dozen of this size a year for donation. I can’t wait to see this book. I could use some new patterns. All of the above. I love lap quilts. All the above pretty much sums it up. 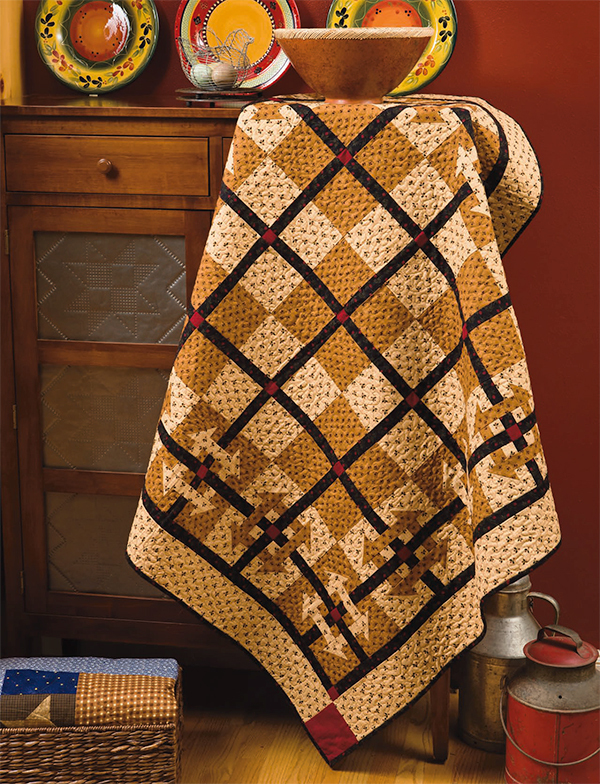 We love lap quilts for watching TV and snuggling with the grandchildren while reading. I like to use a lap quilt while napping. I use lap quilts when reading or working on the computer. I would use this while napping-surrounded in exquisit quilted colot. Decor: draped over chairs and sofas. I use lap quilts when reading, watching tv and sometimes when I nap. All of the above plus for the cat. Lap quilts are perfect for napping and snuggling! These are beautiful! Lovely quilts. I use quilts for all of the above and to make forts, canopies etc. during the kids play time. I will often have a lap quilt covering my legs while watching TV and at the same time I will be stitching down binding on another quilt. In my world that’s a great way to spend an evening! All of the above. I have all of "The Big Book of" and have been anxiously waiting for this one to come out. Love small quilt around the house. Gives so much life and warmth! I love all of them….and I love the big books they are awesome. Excited to see this one! Lap quilts make great gifts. But my favorite thing about lap quilts is the snuggle factor. They are perfect to snuggle up with when on the couch doing whatever you choose to do! All of the above! Thanks for the chance to win! I love using my quilts when watching TV or just reading and now with the frigid cold it may go on the bed for extra warmth. That’s for the giveaway. I use them for decor, my grandchildren use them for playing and napping. Great for curling up with a good book. My kitty loves them too! All of the above. Love the pattern one the book. I like keeping lap quilts in the car, snuggle while traveling, to take into the hotel, use for stops to lunch. All of the above! I am ALWAYS cold so I like an extra wrap/cover ANYtime! And our group makes a lot of quilts for chemo patients, so we could sure use some new patterns and ideas! I just love to see small (lap) quilts displayed the home. All of the above! I rotate lap quilts on my couch for the seasons and also have some in the guest room for the grandkids. I use mine for all of the above – of course! I love lap quilts because they make wonderful gifts for family and friends. I also love them to snuggle under while watching movies with my nephew, reading together and the inevitable nap that happens as well! Thank you for the chance to win! I use them while watching tv. My favorite way to use a lap quilt is curled up on my couch watching a movie while napping!!! 🙂 ha ha Love love love lap quilts best. Typically quick and easy to put together. Thank you for the opportunity to win such a fabulous book! I love to use it in all ways, but my very favorite way is to curl up with my grandchildren and either read a book or just cuddle. Thanks for the giveaway. I use a lap quilt almost every time I curl up on the couch–whether it’s to read, watch TV or do needlework. My cat, Mitzi, enjoys curling up on them with me. My favorite way to use a lap quilt is while napping with my grandson! I have many uses of my lap quilts. As that is the general size I make all of my quilts. I use them for decorating in my house, on the lounge chair in the family room, hanging from a quilt rack in the guest room, for cozying and reading a book. This book looks so fabulous. Thanks for the giveaway. definitely need to check "All of the Above"!! Use them while curled up watching tv. When I get home from working a 12 hour shift as a nurse,after my shower while I play with my cats and am drinking a glass of wine. Lap quilts, good books, cuppa tea are go-togethers in my house! Lap quilts are great because they can be finished fairly quickly as I sometimes get bored with making large quilts 🙂 I am planning to donate several lap quilts to a Hospice House, which recently opened here. I like to use them at night when I’m sewing. All of the above! Especially while watching tv at night though. Believe it or not, it gets chilly in Arizona at night! With old leaky windows and doors, you get some cold drafts. A lap quilt that a friend made for me 15 years ago is used all the time. Lap quilts are definitely for watching TV and for reading. Also good for wrapping around cold feet on an ottoman while doing either of the above. I use a lap quilt when I’m reading, watching a movie, and doing needlework. All of the above (not so much napping)…. no time, rather be quilting! I love to curl up with a good quilt and a good book! I love lap quilts for all the listed reasons. Plus the authors are among my favorite quilt designers! Looks like a fabulous book! All of the above for me – and also wrapped up as gifts to friends. I love to curl up in a comfy chair with a good book and my lap quilt. I love to decorate with lap quilts. Whether it be to cover a table or draped over a chair, I love seeing them, feeling them, living with them…..and I LOVE your Big Books!! I started making lap quilts and little quilts when it was all my budget would allow. Now I’m addicted to them and they make the perfect gifts too. I have them everywhere in my house. They add warmth both physically and visually. They add texture and a pop of color in small doses yet less boring than a pillow. And you can make them faster so you can get on to the next quilt on your list. I love cuddling with a lap quilt during the evening when I am reading a book or watching TV. Lap quilts are fun to make since they can be sewn up more quickly than a queen quilt! I love to curl up with a lap quilt while reading or watching TV but I also love having them draped over chairs for their beauty. I love lap quilts because they’re so versatile—decorative yet practical. Thanks for the opportunity to win this lovely book! I generally have a lap quilt over my knee while working on projects in Winter, or to brighten up my furniture! I love freshening my decor but my favorite is when reading! I love getting into a book and feeling snuggly war! All the places, all the time! I love a soft lap quilt when I’m watching tv or reading. I love lap quilt for when I read it or when I take that rare afternoon nap! All the above. I use my quilts while I’m reading, watching tv, as a decoration and while napping. All of the above. But most are hung on my railing that separates my stairs from my dinning room. I tend to give most away. I use "sofa" quilts almost any time I sit in my comfortable chair … and my husband likes his, too! We would love the quits featured in this new book. Thanks! I like to cover myself with one while I’m watching TV at night. All of the above. They also make wonderful gifts and donations to fundraisers. All of the above. I make more lap quilts than any other size. I love lap quilts for snuggling while I read in front of the fireplace. A cozy evening. All of the above! My mom loves to hand quilt and said she’d quilt all that I make as long as they are on the smaller side, so lap quilts are what I make. My friend has the book and after looking through the book, I need a copy. I love to make quilts. They bring a sort of peace and tranquility about as if I’m in my own little world when i’m creating a new quilt. All of the above plus they are great for gift giving! I love lap quilts for all those reasons listed above and use them daily while watching TV or doing embroidery. My family loves to cuddle up in them too. I change them out for the seasons to use as part of my decorating scheme. 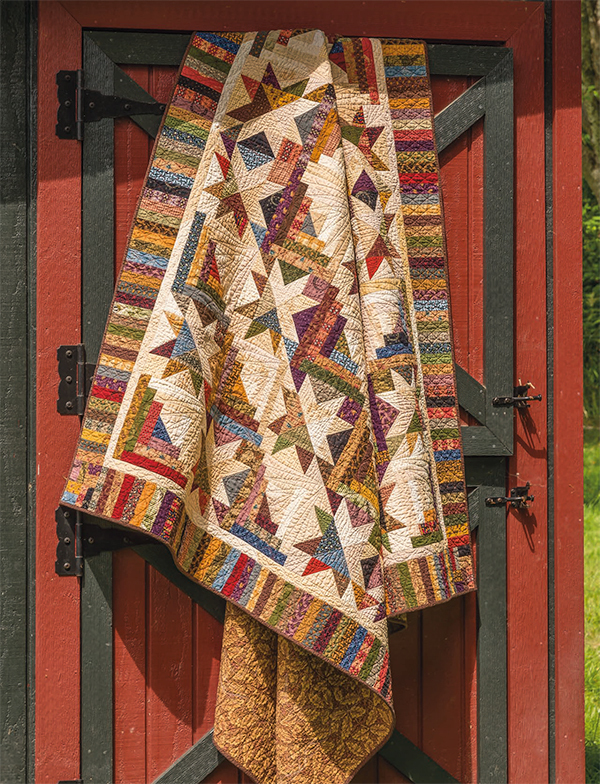 I happen to really like most of the quilts featured in this book which is unusual but some are designed by Kim Diehl, one of my favorite quilt designer and author. I love the cozy look of them through out my house – and the grandkids love to wrap up in them. All of the above and as gifts. I love to turn lap quilts into slightly larger quilts by adding beautiful borders to them. All the above, especially while sitting and doing handwork. All of the above for sure, plus they make great gifts! I’d love lap quilts they don’t take as long to finish and they always seem to really please the one you make and give to someone. Thanks for giving me a chance to win one. Please keep up the beautiful work and the sharing with others of your ideas. I have made Cheryl Walls quilt using as close to the same fabrics as I could find. It is so cuddly with a flannel back! I use lap quilts for all of the reasons listed. I especially like to use one when using my computer while sitting on the couch. Real cozy. All of the above. I do love cozying up with a quilt while watching tv. ALL of the above! This is my favorite size quilt. I have made larger and smaller but I really like this handy and reasonable (easier to quilt on my home machine) size quilt! Thanks for the opportunity to have this lovely book! My favorite time to curl up with a lap quilt is always watching TV but it was more special when our little Maltese was alive, she loved laying on a quilt and she would be right there with me, curled up in between my legs as they were stretched out straight or snuggled up next to me on the couch. Animals seem to love to lay on quilts! All of the above. What a wonderful resource. Need a gift? Bet you can find the perfect quilt in this book. Thanks for the chance of winning. I love lap quilts. I use them to cover with when I am reading or watching TV. Also display them on the walls on quilt hanger shelves that my husband made for me. Also give away to Community Service through my quilt guild and the local police department. All of the above — especially for the grandkids tv watching & napping. Love this book! Thanks for the giveaway. I love them for watching TV. And they are a good size for gifting to my great-granddaughters. I love the Big Book of Table Toppers and know I’m gonna love this book as well. All of the above! Lap quilts are my favorite size as they are quick and I can quilt them myself. I would love to have a copy of this book. Love the Big Book series. Thanks for another great giveaway. I love to decorate with this size quilt. I switch them out on my living room wall. I also drop them over the back of the sofa and chairs! They work great as a table topper too! Relaxing, napping, and just for decoration around the room. Especially during the cold Maine winters. I can’t believe I am at the point where I want a nap once in a while lol. Lap quilts are a great size to practice free-motion quilting or ruler work. And, then they make the greatest gift to let someone know they are loved. All of the above! What a beautiful collection!!! I love to drape them over the couch when I’m not using one to snuggle in while watching tv. I love using a lap quilt while I am watching TV. All of the above, but especially when watching TV. All of the reasons above, plus they are a much quicker finish than a bed quilt. Lap quilts are the best. I cuddle in one every night while watching TV. I have them folded over chairs and my quilt rack. I drape them on the back of my sofa. Love, love, love them. While watching tv and snuggling with my puppies. All of the above! The best feeling is seeing a family member napping on the couch under a quilt I made! My favorite way to use a lap quilt is when I’m hand sewing watching tv. All of the above, I display my lap quilts through our home. Love curling up with a quilt for comfort. Most of my lap quilts are given to Hospice Home. Quilts are meant to be used and so my favorite uses are reading with a quilt or napping with a quilt. Great designs in this book. Love it!! Lap quilts are the best type of quilt to sew and to gift. So versatile for using in any of the activities you listed, especially for napping! Having moved from the southwest desert to a place that actually gets cold and wet, I definitely need to add some lap quilts to our home. 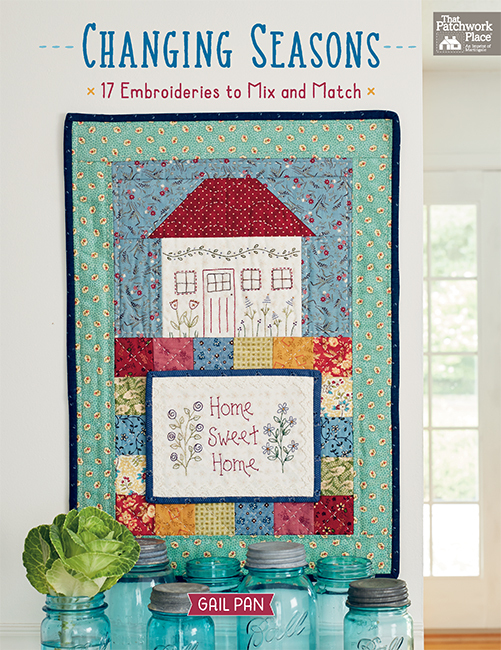 This book looks wonderful, with all different flavors of quilt designs! I use them to read under, snuggle under, watch tv under, sleep under. We have a new puppy and it’s such a joy to show him the sweet pleasure of being two under a quilt, cozy. I use lap quilts for all of the reasons listed. I also like to make lap quilts .vs bed size quilts. I use lap quilts in every room in the house, and for every purpose listed. They are so versatile, and lend such a cared-for look. In fact, I’ve made so many lap-size quilts that I only have ONE bed-size quilt on a bed. Trying to remedy that this year! Love lap quilts – so it would have to be "All of the Above"
Lap quilts are terrific to freshen up my décor and to keep cozy while reading a good book, especially during this cold winter! All of the above. Plus I can Quilt them myself. You can only use so many bed quilts. Throws are the main size quilt I make, and I use them in all the ways listed. Nothing better than cozying up under a quilt to feel like you’re getting a big cuddle. I like to grab one every time I stop to relax! All of the above and for a lot of my gifts. I use them for all of the above. What a wonderful collection on quilts! All of the above! I love making this size quilt, quick and easy, great for gifts, and we always have several ready to cuddle in while watching TV. I like lap quilts because they are easier to finish than a large quilt and you can show them off a little bit more–hang them and use as a throw over the couch. I use the lap quilt in the morning when I have breakfast. And when I’m reading. I’d have to say: While designing on the sofa! I have one near my recliner and use it whenever I’m sitting in it, so my answer is all the above. I use lap quilts reading, sewing, napping and love them ! Nice and cozy ! I have an old wooden rocker that I like to use to display lap quilts. All of the above, but the best reason is that lap quilts are just the right size to wrap someone in a warm hug! For nap time of course! I love a lap quilt for cuddling up with a good book! They all look like they would be perfect. I love to make lap quilts. They can be done in no time and serve a lot of purposes. They’re not just for lolling around watching tv. They can be used as table toppers. Or put one folded at the foot of the bed. Carry one in the car, just because. Leave one over the arm of a chair. Take them on a picnic…not just one! Hang them on the wall. Is their a specific size for a lap quilt? I think they look great covering all your grandchildren. I mostly use small/lap quilts for home decoration, but sometimes they get put to use for reading or naps. No TV here. I don’t use them often, but my main use is for covering when I am cold either while watching tv or as an extra covering at night. All of the above ! I have them all around the house and rotate with season change. I love them ! I’m an elderly quilter that has a lap quilt over my knees every time I sit in my comfy chair. Definitely a Gramma look. And lap quilts are the biggest I make anymore. They decorate every room in my house and my children’s houses. Great idea for a book! i love to read in front of the fireplace (on the floor) and usually fall asleep. a small lap quilt is perfect for that! I love lap quilts, I am under 5 ft tall and they are the perfect size for me to snuggle under while watching tv and taking on the road cause in always cold when hubby has the ac turned on. Love every one of these shown. Love to keep my grandkids warm under lap quilts. All of the above. And I love that they make up faster than a queen quilt. To freshen up my home decor. I have several of them hangin on the walls. All of the above! I love curling under one in front of the fire when it’s cold. And seeing them draped over the couch back during the warmer times. Always a spot for a quilt! This book looks awesome. Would love to make several of these. Thanks for the giveaway! I like to use quilt while reading. I use my to decorate and then to snuggle up when watching TV. I’d have to say lap quilts are cozy for all of your above reasons. Also I’d like to include cozying up with one while you’re curled up in your lounger chair while sick, which happened to me last fall. Lap quilts are fun to make and can add so much to one’s décor. Throw guilts are great for quick gifts or to try new blocks. Also great for display in the living room. I use lap quilts for all of the above! This book looks like a winner! Definitely for reading, and sometimes TV, which very often turns into napping. I have one one the way just for that purpose. I enjoy wrapping up in a lap quilt with a cup of coffee and reading a book! That is generally the size quilt I enjoy making because it’s easier to quilt on my machine. I have many lap quilts and use them for everything! Looks like another great book. All of the above, especially when I nap. All of the above! Beautiful book. All of the above, plus they are great for gifting. I love the look of quilts for decor, but I also love to sit under one and watch a good movie!!! all of the above! and being smaller than a whole bed quilt,they take less time to make, so you can make more! all of the above, and being smaller than a bed quilt, I get to make more! All of the above!!! I just love the size and comfort of a lap quilt. I have a favorite and it makes a good book a little bit better, a tv show a bit more exciting and a nap just that much more cozier. It’s a nice size to work with during construction, too. What a beautiful book! All of the above – lap quilts are perfect size for machine quilting. All of the above, with emphasis on snuggling! I use a lap quilt when watching tv. Any time I find my recliner, there’s a lap quilt handy! When reading and doing counted cross-stitch. My answer would be all of the above. Quilts are great decorations but they should be used and loved! I use lap quilts while I nap in a chair or on the couch. I use my quilt any time I just want to snuggle under it–reading, sleeping, watching TV. For me, it’s all of the above. Love this size to quilt. All of the above as well as for gifts! They are the perfect size and I would love to win this book! To freshen up my decor. I like to put them on the sofa. Would love to own this book. It’s filled with lots of beautiful looking quilts. I love lap quilts anywhere I can place them; love to use a lap quilt while watching TV on a cool evening. I cover up with one while reading in front of the TV until I fall asleep! All of the above. What a wonderful book! Which one to make first? I use them for all the above. All three of the above, plus they make great gifts. And since they’re smaller I can play with more gorgeous fabric! All of the above. We have a lap quilt my Nana made me that is always on the couch. All of the above! I love making lap-sized quilts — go together quickly, and are easier to quilt. Looks like a great book! Reading, although the most enjoyable part is the making. I love to throw lap quilts across the back of a chair. It brightens the room and is always close at hand when needed to keep warm. I love to use them to brighten up the living room and then use them to keep me toasty in the evening watching TV. I use lap quilts to throw on the back of my cream coloured couch and loveseat as decor. I love this size as well to roll up amd display in my large wicker basket in my living room and they are not as expensive to make! What an awesome book! Beautiful quilts! I use quilts in all the above ways. All of the above! Thanks! I like lap quilts for watching TV in the winter, also like to gift them. What a beautiful book! I have made a lot of lap quilts, but there is always room for more. There are so many ways to display them, fun! All of the above…the book looks wonderful! my favorite way to use my throw quilts are when I’m napping or if I get chilled at night I’ll throw one or two on top of my bed for some extra warmth. I LOVE lap quilts for all of the above reasons. They really do help me change up home decor. Every time I sit down, I’ve got a quilt to wrap up into—especially in the cool fall and COLD winters in ND! All of the above!!! I love lab quilts and so do my fur-babies! Have a lap quilt on me and a cat on top of that right now! The couch and loveseat could each use one, to brighten them up, and be ready to cuddle under. Also, the cat seems to appreciate cotton over fleece throws. As for me, I desperately need to complete a project – this size looks perfect – to give me a sense of accomplishment. This book looks great! I love lap quilts for helping me to feel cozy while curling up with a good book and a cup of tea. I also love the spots of color when the lap quilt is tossed on a sofa or chair. Lap quilts? The whole family loves them for all sorts of reasons, including when ever napping on the couch or in bed; reading, watching tv, riding in the car. I’d love to win this book. I use a lap quilt for watching TV and for napping. Such a nice variety of designs! My favorite way to use a lap quilt is to watch tv or read! I like lap quilts for reading. My quilting group makes charity lap quilts so this book would be great for new ideas. Lap (I call them "nap") quilts are perfect for grandchildren and charities. Have had my eye on this book ever since it was first advertised. I Love making lap quilts to donate. I like this size to give to women and children who seek shelter at the domestic abuse center. They often leave home with very few, if any, personal items. I love making lap quilts to gift them to my family. Is just a wonderful satisfaction seeing their happy faces when they see i made them a quilt. Handmade/homemade goodies are always the best!! I love the big books! I will use a lap quilt to hibernate under this winter. I use lap quilts to make my house look homey. They always are in use, for taking the chill off the air conditioner in the summer, and staying warm in the winter. I see several in the book that I could really use. My favorite way to use a lap quilt? I snuggle under a lap quilt while I’m stitching! I use them mostly to freshen up my home decor but all the uses listed are great. Lap Quilts are just the PERFECT size. Too many reasons to list! Easier to make than bed quilts, but more usable than minis! Really, the most perfect size.